The recent sighting of a Gray whale off the coast of Israel has triggered great excitement, confusion and some head scratching amongst conservation experts as it either heralds the return of the North Atlantic Gray whale (thought to have been extinct for hundreds of years), or the whale in question has shattered all previous records for the longest migration by the species, and probably the strangest. 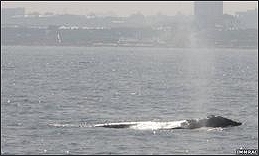 A Gray whale, seen off Israel, has completely baffled scientists and whale experts. At one stage there were three populations of Gray whale. The North Atlantic population became extinct in the 17th - 18th centuries for reasons that are not clear, and no sightings have been made since. Today there is a tiny remnant population in the western North Pacific of no more than a few hundred individuals (listed by the IUCN as Critically Endangered). The main surviving population is found in the eastern North Pacific where, despite having had their population numbers reduced to a few hundred at one stage, has now recovered to some 20,000. So, for a Gray whale to appear in the Mediterranean like this it must either have travelled a very long distance by a highly unusual route, or it signals the possible return of the North Atlantic Gray whale from extiction. Gray whale in the Mediterranean. First sighting for 200 + years. After the whale was spotted off the coast of Herzliya Marina, researchers from IMMRAC (Israel Marine Mammal Research & Assistance Centre) in Israel went to investigate on the 9th May, and it was only when they took a look at their photographs back on dry land that the enormity of the situation became clear. WDCS Species Programme Lead, Nicola Hodgins said; "This discovery is truly amazing. Today, Gray whales only inhabit the Pacific Ocean, so to find one in the North Atlantic, let alone the Mediterranean Sea, is bizarre in the extreme." "Gray whales are well known for performing one of the world's longest migrations, making a yearly round trip of 15,000-20,000 kms. Over a lifetime, a gray whale migrates the equivalent distance of a return trip to the moon; however, these new images show that this particular whale would have had to beat all previous distance records to end up where it has. Its presence off the coast of Israel will certainly pose a lot of questions to the scientific community."